Aristarchus, Prinz and the Harbinger Mtns. The kilometer high rim of Prinz (47 km.) crater was casting a shadow across its own lava flooded floor. The uplifted Harbinger mountains were also casting fine shadows in this region of the lunar surface with its large magma ponds pushing up and freezing in the distant past. The uplifting doming in the region created many fissures for lava escape and flooding to occur. The fissures can be seen clearly on nights of steading seeing. I was denied that detailed view on this night. From the crater Krieger (22 km.) north and somewhat east of Aristarchus (40 km.) four distinct long shadows could be seen crossing to the 70 km. 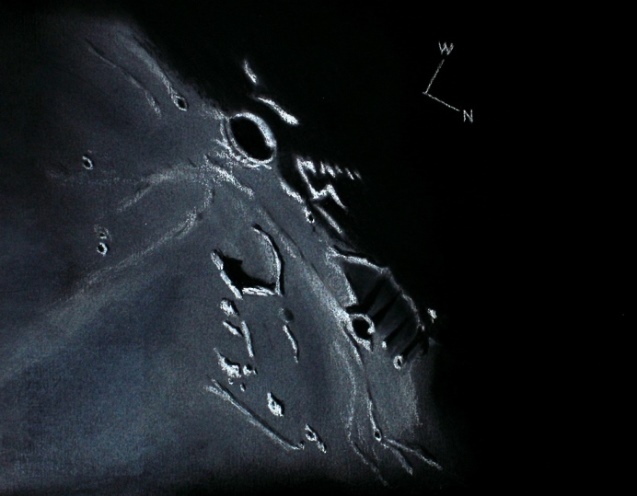 fault called Toscanelli at the edge of the Aristarchus plateau where the terminator was located during the rendering of this sketch. A fine view in any telescope. Thank you, this was a night I remember well on the last night of Spring 2013. Superb Frank! The sketch and the associated story ! great sketch. Show us more!!! Last few days here in Germany the weather offered us many possibilities to observe the moon and the planets. So I was busy at my telescopes. Thank you all for the kind comments on this sketch. The next posts are yours and I look forward to them.